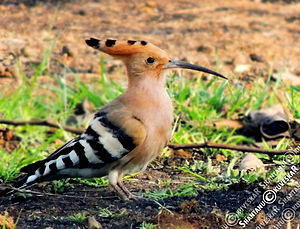 Every time we turn off the village road onto our rough track, the anticipation rises that we will see hoopoes. They are the most exotic-looking bird which is resident here all year round. Their favoured place seems to be amongst the olive groves, we rarely see them around the house. Or perhaps it is simply that they are easier to spot on bare ground as they probe the earth for insects and worms. Their brilliant plumage makes them surprisingly well camouflaged when they sit in trees, sometimes we just hear their call. Poop-poop-poop. In flight their black and white striped wings are quite similar to jays, but there is no mistaking the pink crest on their head. This entry was posted in Nature and tagged Andalucia, birds, nature, Sandra Danby, Spain on May 3, 2013 by sandradan1. What an extraordinary bird! He’s both elegant and funny. Hoopoes are the unofficial national bird of Israel, so I’m guessing since you have them in Spain, they must love the Mediterranean area. Thanks for the photo of this handsome man.